Here is the introduction to a new version of my paper, “Hayek and Three Concepts of Intertemporal Equilibrium” which I presented last June at the History of Economics Society meeting in Toronto, and which I presented piecemeal in a series of posts last May and June. This post corresponds to the first part of this post from last May 21. Equilibrium is an essential concept in economics. While equilibrium is an essential concept in other sciences as well, and was probably imported into economics from physics, its meaning in economics cannot be straightforwardly transferred from physics into economics. The dissonance between the physical meaning of equilibrium and its economic interpretation required a lengthy process of explication and clarification, before the concept and its essential, though limited, role in economic theory could be coherently explained. The concept of equilibrium having originally been imported from physics at some point in the nineteenth century, economists probably thought it natural to think of an economic system in equilibrium as analogous to a physical system at rest, in the sense of a system in which there was no movement or in the sense of all movements being repetitive. But what would it mean for an economic system to be at rest? The obvious answer was to say that prices of goods and the quantities produced, exchanged and consumed would not change. If supply equals demand in every market, and if there no exogenous disturbance displaces the system, e.g., in population, technology, tastes, etc., then there would seem to be no reason for the prices paid and quantities produced to change in that system. But that conception of an economic system at rest was understood to be overly restrictive, given the large, and perhaps causally important, share of economic activity – savings and investment – that is predicated on the assumption and expectation that prices and quantities not remain constant. The model of a stationary economy at rest in which all economic activity simply repeats what has already happened before did not seem very satisfying or informative to economists, but that view of equilibrium remained dominant in the nineteenth century and for perhaps the first quarter of the twentieth. Equilibrium was not an actual state that an economy could achieve, it was just an end state that economic processes would move toward if given sufficient time to play themselves out with no disturbing influences. This idea of a stationary timeless equilibrium is found in the writings of the classical economists, especially Ricardo and Mill who used the idea of a stationary state as the end-state towards which natural economic processes were driving an an economic system. This, not very satisfactory, concept of equilibrium was undermined when Jevons, Menger, Walras, and their followers began to develop the idea of optimizing decisions by rational consumers and producers. The notion of optimality provided the key insight that made it possible to refashion the earlier classical equilibrium concept into a new, more fruitful and robust, version. If each economic agent (household or business firm) is viewed as making optimal choices, based on some scale of preferences, and subject to limitations or constraints imposed by their capacities, endowments, technologies, and the legal system, then the equilibrium of an economy can be understood as a state in which each agent, given his subjective ranking of the feasible alternatives, is making an optimal decision, and each optimal decision is both consistent with, and contingent upon, those of all other agents. The optimal decisions of each agent must simultaneously be optimal from the point of view of that agent while being consistent, or compatible, with the optimal decisions of every other agent. In other words, the decisions of all buyers of how much to purchase must be consistent with the decisions of all sellers of how much to sell. But every decision, just like every piece in a jig-saw puzzle, must fit perfectly with every other decision. If any decision is suboptimal, none of the other decisions contingent upon that decision can be optimal. The idea of an equilibrium as a set of independently conceived, mutually consistent, optimal plans was latent in the earlier notions of equilibrium, but it could only be coherently articulated on the basis of a notion of optimality. Originally framed in terms of utility maximization, the notion was gradually extended to encompass the ideas of cost minimization and profit maximization. The general concept of an optimal plan having been grasped, it then became possible to formulate a generically economic idea of equilibrium, not in terms of a system at rest, but in terms of the mutual consistency of optimal plans. Once equilibrium was conceived as the mutual consistency of optimal plans, the needlessly restrictiveness of defining equilibrium as a system at rest became readily apparent, though it remained little noticed and its significance overlooked for quite some time. Because the defining characteristics of economic equilibrium are optimality and mutual consistency, change, even non-repetitive change, is not logically excluded from the concept of equilibrium as it was from the idea of an equilibrium as a stationary state. An optimal plan may be carried out, not just at a single moment, but over a period of time. Indeed, the idea of an optimal plan is, at the very least, suggestive of a future that need not simply repeat the present. So, once the idea of equilibrium as a set of mutually consistent optimal plans was grasped, it was to be expected that the concept of equilibrium could be formulated in a manner that accommodates the existence of change and development over time. But the manner in which change and development could be incorporated into an equilibrium framework of optimality was not entirely straightforward, and it required an extended process of further intellectual reflection to formulate the idea of equilibrium in a way that gives meaning and relevance to the processes of change and development that make the passage of time something more than merely a name assigned to one of the n dimensions in vector space. This paper examines the slow process by which the concept of equilibrium was transformed from a timeless or static concept into an intertemporal one by focusing on the pathbreaking contribution of F. A. Hayek who first articulated the concept, and exploring the connection between his articulation and three noteworthy, but very different, versions of intertemporal equilibrium: (1) an equilibrium of plans, prices, and expectations, (2) temporary equilibrium, and (3) rational-expectations equilibrium. But before discussing these three versions of intertemporal equilibrium, I summarize in section two Hayek’s seminal 1937 contribution clarifying the necessary conditions for the existence of an intertemporal equilibrium. Then, in section three, I elaborate on an important, and often neglected, distinction, first stated and clarified by Hayek in his 1937 paper, between perfect foresight and what I call contingently correct foresight. That distinction is essential for an understanding of the distinction between the canonical Arrow-Debreu-McKenzie (ADM) model of general equilibrium, and Roy Radner’s 1972 generalization of that model as an equilibrium of plans, prices and price expectations, which I describe in section four. Radner’s important generalization of the ADM model captured the spirit and formalized Hayek’s insights about the nature and empirical relevance of intertemporal equilibrium. But to be able to prove the existence of an equilibrium of plans, prices and price expectations, Radner had to make assumptions about agents that Hayek, in his philosophically parsimonious view of human knowledge and reason, had been unwilling to accept. In section five, I explore how J. R. Hicks’s concept of temporary equilibrium, clearly inspired by Hayek, though credited by Hicks to Erik Lindahl, provides an important bridge connecting the pure hypothetical equilibrium of correct expectations and perfect consistency of plans with the messy real world in which expectations are inevitably disappointed and plans routinely – and sometimes radically – revised. The advantage of the temporary-equilibrium framework is to provide the conceptual tools with which to understand how financial crises can occur and how such crises can be propagated and transformed into economic depressions, thereby making possible the kind of business-cycle model that Hayek tried unsuccessfully to create. But just as Hicks unaccountably failed to credit Hayek for the insights that inspired his temporary-equilibrium approach, Hayek failed to see the potential of temporary equilibrium as a modeling strategy that combines the theoretical discipline of the equilibrium method with the reality of expectational inconsistency across individual agents. In section six, I discuss the Lucasian idea of rational expectations in macroeconomic models, mainly to point out that, in many ways, it simply assumes away the problem of plan expectational consistency with which Hayek, Hicks and Radner and others who developed the idea of intertemporal equilibrium were so profoundly concerned. After my previous post comparing the neoclassical synthesis in its various versions to the mind-body problem, there was an interesting Twitter exchange between Steve Randy Waldman and David Andolfatto in which Andolfatto queried whether Waldman and I are aware that there are representative-agent models in which the equilibrium is not Pareto-optimal. Andalfatto raised an interesting point, but what I found interesting about it might be different from what Andalfatto was trying to show, which, I am guessing, was that a representative-agent modeling strategy doesn’t necessarily commit the theorist to the conclusion that the world is optimal and that the solutions of the model can never be improved upon by a monetary/fiscal-policy intervention. I concede the point. It is well-known I think that, given the appropriate assumptions, a general-equilibrium model can have a sub-optimal solution. Given those assumptions, the corresponding representative-agent will also choose a sub-optimal solution. So I think I get that, but perhaps there’s a more subtle point that I’m missing. If so, please set me straight. But what I was trying to argue was not that representative-agent models are necessarily optimal, but that representative-agent models suffer from an inherent, and, in my view, fatal, flaw: they can’t explain any real macroeconomic phenomenon, because a macroeconomic phenomenon has to encompass something more than the decision of a single agent, even an omniscient central planner. At best, the representative agent is just a device for solving an otherwise intractable general-equilibrium model, which is how I think Lucas originally justified the assumption. Yet just because a general-equilibrium model can be formulated so that it can be solved as the solution of an optimizing agent does not explain the economic mechanism or process that generates the solution. The mathematical solution of a model does not necessarily provide any insight into the adjustment process or mechanism by which the solution actually is, or could be, achieved in the real world. Your ability to find a solution for a mathematical problem does not mean that you understand the real-world mechanism to which the solution of your model corresponds. The correspondence between your model may be a strictly mathematical correspondence which may not really be in any way descriptive of how any real-world mechanism or process actually operates. Here’s an example of what I am talking about. Consider a traffic-flow model explaining how congestion affects vehicle speed and the flow of traffic. It seems obvious that traffic congestion is caused by interactions between the different vehicles traversing a thoroughfare, just as it seems obvious that market exchange arises as the result of interactions between the different agents seeking to advance their own interests. OK, can you imagine building a useful traffic-flow model based on solving for the optimal plan of a representative vehicle? I don’t think so. Once you frame the model in terms of a representative vehicle, you have abstracted from the phenomenon to be explained. The entire exercise would be pointless – unless, that is, you assumed that interactions between vehicles are so minimal that they can be ignored. But then why would you be interested in congestion effects? If you want to claim that your model has any relevance to the effect of congestion on traffic flow, you can’t base the claim on an assumption that there is no congestion. Or to take another example, suppose you want to explain the phenomenon that, at sporting events, all, or almost all, the spectators sit in their seats but occasionally get up simultaneously from their seats to watch the play on the field or court. Would anyone ever think that an explanation in terms of a representative spectator could explain that phenomenon? In just the same way, a representative-agent macroeconomic model necessarily abstracts from the interactions between actual agents. Obviously, by abstracting from the interactions, the model can’t demonstrate that there are no interactions between agents in the real world or that their interactions are too insignificant to matter. I would be shocked if anyone really believed that the interactions between agents are unimportant, much less, negligible; nor have I seen an argument that interactions between agents are unimportant, the concept of network effects, to give just one example, being an important topic in microeconomics. It’s no answer to say that all the interactions are accounted for within the general-equilibrium model. That is just a form of question-begging. The representative agent is being assumed because without him the problem of finding a general-equilibrium solution of the model is very difficult or intractable. Taking into account interactions makes the model too complicated to work with analytically, so it is much easier — but still hard enough to allow the theorist to perform some fancy mathematical techniques — to ignore those pesky interactions. On top of that, the process by which the real world arrives at outcomes to which a general-equilibrium model supposedly bears at least some vague resemblance can’t even be described by conventional modeling techniques. The modeling approach seems like that of a neuroscientist saying that, because he could simulate the functions, electrical impulses, chemical reactions, and neural connections in the brain – which he can’t do and isn’t even close to doing, even though a neuroscientist’s understanding of the brain far surpasses any economist’s understanding of the economy – he can explain consciousness. Simulating the operation of a brain would not explain consciousness, because the computer on which the neuroscientist performed the simulation would not become conscious in the course of the simulation. Many neuroscientists and other materialists like to claim that consciousness is not real, that it’s just an epiphenomenon. But we all have the subjective experience of consciousness, so whatever it is that someone wants to call it, consciousness — indeed the entire world of mental phenomena denoted by that term — remains an unexplained phenomenon, a phenomenon that can only be dismissed as unreal on the basis of a metaphysical dogma that denies the existence of anything that can’t be explained as the result of material and physical causes. I call that metaphysical belief a dogma not because it’s false — I have no way of proving that it’s false — but because materialism is just as much a metaphysical belief as deism or monotheism. It graduates from belief to dogma when people assert not only that the belief is true but that there’s something wrong with you if you are unwilling to believe it as well. The most that I would say against the belief in materialism is that I can’t understand how it could possibly be true. But I admit that there are a lot of things that I just don’t understand, and I will even admit to believing in some of those things. New Classical macroeconomists, like, say, Robert Lucas and, perhaps, Thomas Sargent, like to claim that unless a macroeconomic model is microfounded — by which they mean derived from an explicit intertemporal optimization exercise typically involving a representative agent or possibly a small number of different representative agents — it’s not an economic model, because the model, being vulnerable to the Lucas critique, is theoretically superficial and vacuous. But only models of intertemporal equilibrium — a set of one or more mutually consistent optimal plans — are immune to the Lucas critique, so insisting on immunity to the Lucas critique as a prerequisite for a macroeconomic model is a guarantee of failure if your aim to explain anything other than an intertemporal equilibrium. Unless, that is, you believe that real world is in fact the realization of a general equilibrium model, which is what real-business-cycle theorists, like Edward Prescott, at least claim to believe. Like materialist believers that all mental states are epiphenomenous, and that consciousness is an (unexplained) illusion, real-business-cycle theorists purport to deny that there is such a thing as a disequilibrium phenomenon, the so-called business cycle, in their view, being nothing but a manifestation of the intertemporal-equilibrium adjustment of an economy to random (unexplained) productivity shocks. According to real-business-cycle theorists, such characteristic phenomena of business cycles as surprise, regret, disappointed expectations, abandoned and failed plans, the inability to find work at wages comparable to wages that other similar workers are being paid are not real phenomena; they are (unexplained) illusions and misnomers. The real-business-cycle theorists don’t just fail to construct macroeconomic models; they deny the very existence of macroeconomics, just as strict materialists deny the existence of consciousness. What is so preposterous about the New-Classical/real-business-cycle methodological position is not the belief that the business cycle can somehow be modeled as a purely equilibrium phenomenon, implausible as that idea seems, but the insistence that only micro-founded business-cycle models are methodologically acceptable. It is one thing to believe that ultimately macroeconomics and business-cycle theory will be reduced to the analysis of individual agents and their interactions. But current micro-founded models can’t provide explanations for what many of us think are basic features of macroeconomic and business-cycle phenomena. If non-micro-founded models can provide explanations for those phenomena, even if those explanations are not fully satisfactory, what basis is there for rejecting them just because of a methodological precept that disqualifies all non-micro-founded models? According to Kevin Hoover, the basis for insisting that only micro-founded macroeconomic models are acceptable, even if the microfoundation consists in a single representative agent optimizing for an entire economy, is eschatological. In other words, because of a belief that economics will eventually develop analytical or computational techniques sufficiently advanced to model an entire economy in terms of individual interacting agents, an analysis based on a single representative agent, as the first step on this theoretical odyssey, is somehow methodologically privileged over alternative models that do not share that destiny. Hoover properly rejects the presumptuous notion that an avowed, but unrealized, theoretical destiny, can provide a privileged methodological status to an explanatory strategy. The reductionist microfoundationalism of New-Classical macroeconomics and real-business-cycle theory, with which New Keynesian economists have formed an alliance of convenience, is truly a faith-based macroeconomics. The remarkable similarity between the reductionist microfoundational methodology of New-Classical macroeconomics and the reductionist materialist approach to the concept of mind suggests to me that there is also a close analogy between the representative agent and what philosophers of mind call a homunculus. The Cartesian materialist theory of mind maintains that, at some place or places inside the brain, there resides information corresponding to our conscious experience. The question then arises: how does our conscious experience access the latent information inside the brain? And the answer is that there is a homunculus (or little man) that processes the information for us so that we can perceive it through him. 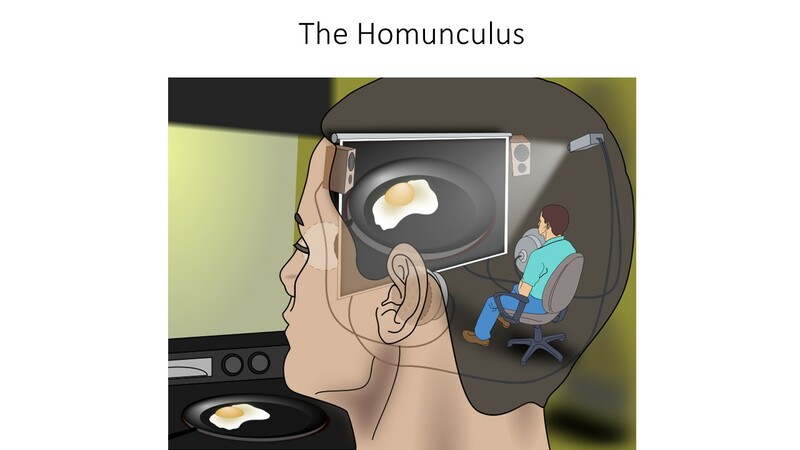 For example, the homunculus (see the attached picture of the little guy) views the image cast by light on the retina as if he were watching a movie projected onto a screen. But there is an obvious fallacy, because the follow-up question is: how does our little friend see anything? Well, the answer must be that there’s another, smaller, homunculus inside his brain. You can probably already tell that this argument is going to take us on an infinite regress. So what purports to be an explanation turns out to be just a form of question-begging. Sound familiar? The only difference between the representative agent and the homunculus is that the representative agent begs the question immediately without having to go on an infinite regress. PS I have been sidetracked by other responsibilities, so I have not been blogging much, if at all, for the last few weeks. I hope to post more frequently, but I am afraid that my posting and replies to comments are likely to remain infrequent for the next couple of months. I recently discussed Paul Romer’s criticism of Robert Lucas for shifting from the Feynman integrity that, in Romer’s view, characterized Lucas’s early work, to the Stigler conviction that Romer believes has characterized Lucas’s later work. I wanted to make a criticism of Lucas different from Romer’s, so I only suggested in passing that that the Stigler conviction criticized by Romer didn’t seem that terrible to me, and I compared Stigler conviction to Galileo’s defense of Copernican heliocentrism. Now, having reread the essay, “The Nature and Role of Originality in Scientific Progress,” from which Romer quoted, I find, as I suspected, that Romer has inaccurately conveyed the message that Stigler meant to convey in his essay. In accusing Lucas of forsaking the path of Feynman integrity and chosing instead the path of Stigler conviction, making it seem as if Stigler had provided justification for pursuing an ideological agenda, as Romer believes Lucas and other freshwater economists have done, Romer provides no information about the context of Stigler’s essay. Much of Stigler’s early writing in economics was about the history of economics, and Stigler’s paper on originality is one of those; in fact, it was subsequently republished as the lead essay in Stigler’s 1965 volume Essays in the History of Economics. What concerns Stigler in the essay are a few closely related questions: 1) what characteristic of originality makes it highly valued in science in general and in economics in particular? 2) Given that originality is so highly valued, how do economists earn a reputation for originality? 3) Is the quest for originality actually conducive to scientific progress? Scientific originality in its important role should be measured against the knowledge of a man’s contemporaries. If he opens their eyes to new ideas or to new perspectives on old ideas, he is an original economist in the scientifically important sense. . . . Smith, Ricardo, Jevons, Walras, Marshall, Keynes – they all changed the beliefs of economists and thus changed economics. It is conceivable for an economist to be ignored by contemporaries and yet exert considerable influence on later generations, but this is a most improbable event. He must have been extraordinarily out of tune with (in advance of?) his times, and rarely do first-class minds throw themselves away on the visionary. Perhaps Cournot is an example of a man whose work skipped a half a century, but normally such men become famous only by reflecting the later fame of the rediscovered doctrines. Originality then in its scientifically important role, is a matter of subtle unaccustomedness – neither excessive radicalism nor statement of the previous unformulated consensus. New ideas are even harder to sell than new products. Inertia and the many unharmonious voices of those who would change our ways combine against the balanced and temperate statement of the merits of one’s ” original ” views. One must put on the best face possible, and much is possible. Wares must be shouted — the human mind is not a divining rod that quivers over truth. What are those techniques? And who used them? Although Stigler asserted that all but two famous economists used such techniques, he mentioned only two by name, and helpfully provided the specific evidence of their resort to huckster-like self-promotional techniques. Whom did Stigler single out for attention? William Stanley Jevons and Eugen von Bohm-Bawerk. Writing a Theory of Political Economy, he devoted the first 197 pages of a book of 267 pages to his ideas on utility! OMG! Shocking; just shocking. How could he have stooped so low as that? But Bohm-Bawerk was even worse. Not content with writing two volumes, and dozens of articles, in presenting and defending his capital theory, he added a third volume (to the third edition of his Positive Theorie des Kapitals) devoted exclusively to refuting, at least to his own satisfaction, every criticism that had arisen during the preceding decades. What a sordid character that loathsome Austrian aristocrat must have been! Publishing a third volume devoted entirely to responding to criticisms of the first two. The idea! Well, actually, they weren’t as bad as you might have thought. Let’s read Stigler’s next paragraph. Although the new economic theories are introduced by the technique of the huckster, I should add that they are not the work of mere hucksters. The sincerity of Jevons, for example, is printed on every page. Indeed I do not believe that any important economist has ever deliberately contrived ideas in which he did not believe in order to achieve prominence: men of the requisite intellectual power and morality can get bigger prizes elsewhere. Instead, the successful inventor is a one-sided man. He is utterly persuaded of the significance and correctness of his ideas and he subordinates all other truths because they seem to him less important than the general acceptance of his truth. He is more a warrior against ignorance than a scholar among ideas. I believe that Romer misunderstood what Stigler mean to say here. Romer seems to interpret this passage to mean that if a theorist is utterly convinced that he is right, he somehow can be justified in “subordinat[ing] all other truths” in cutting corners, avoiding contrary arguments or suppressing contradictory evidence that might undercut his theory – the sorts of practices ruled out by Feynman integrity, which is precisely what Romer was accusing Lucas of having done in a paper on growth theory. But to me it is clear from the context that what Stigler meant by “subordinating all other truths” was not any lack of Feynman integrity, but the single-minded focus on a specific contribution to the exclusion of all others. That was why Stigler drew attention to the exorbitant share of Jevons’s book entitled Principles of Political Economy devoted to the theory of marginal utility or the publication by Bohm-Bawerk of an entire volume devoted to responding to criticisms of his two earlier volumes on the theory of capital and interest. He neither implied nor meant to suggest that either Jevons or Bohm-Bawerk committed any breach of scientific propriety, much less Feynman integrity. John Stuart Mill is a striking example with which to illustrate the foregoing remarks. He is now considered a mediocre economist of unusual literary power; a fluent, flabby echo of Ricardo. This judgement is well-nigh universal: I do not believe that Mill has had a fervent admirer in the twentieth century. I attribute this low reputation to the fact that Mill had the perspective and balance, but not the full powers, of Smith and Marshall. He avoided all the tactics of easy success. He wrote with extraordinary balance, and his own ideas-considering their importance-received unbelievably little emphasis. The bland prose moved sedately over a corpus of knowledge organized with due regard to structure and significance, and hardly at all with regard to parentage. . . . Yet however one judges Mill, it cannot be denied that he was original. In terms of identifiable theories, he was one of the most original economists in the history of the science. This is a very respectable list of contributions. But it is also a peculiar list: any one of the contributions could be made independently of all the others. Mill was not trying to build a new system but only to add improvements here and there to the Ricardian system. The fairest of economists, as Schumpeter has properly characterized Mill, unselfishly dedicated his abilities to the advancement of the science. And, yet, Mill’s magisterial quality and conciliatory tone may have served less well than sharp and opinionated controversy in inciting his contemporaries to make advances. Finally, just to confirm the lack of ideological motivation in Stigler’s discussion, let me quote Stigler’s characteristically ironic and playful conclusion. These reflections on the nature and role of originality, however, have no utilitarian purpose, or even a propagandistic purpose. If I have a prejudice, it is that we commonly exaggerate the merits of originality in economics–that we are unjust in conferring immortality upon the authors of absurd theories while we forget the fine, if not particularly original, work of others. But I do not propose that we do something about it.